Abstract: Unlike DDR, purchasing RDRAM is a little more tedious. Users of RDRAM must buy them in matching pairs. Intel originally introduced Rambus DRAM back in the days of the Pentium 3, the purpose of this was to try and saturate the market with RDRAM by the time the Pentium 4 was released. It was a good idea, however users who did shell out the money for the RDRAM (which at the time was about 5x more expensive then regular SDRAM) found performance with a Pentium 3 rather disappointing. Often times a Pentium 3 with PC800 RDRAM would perform worse the same processor teamed up with good ole PC133 SDRAM! The situation was unacceptable to the hardware community and consumers in general, and Intel, felt the backlash almost immediately. That is all in the past, though a few diehards like Chris Tom from the once mighty AMDzone, still keep the fires alive and well at www.boycottrambus.com . The past was bitter, but the industry seems to be warming up to Rambus once again, and now, RDRAM and Pentium 4's go together like a car and driver. Currently only dual channel RDRAM can feed a Pentium 4's bandwidth needs. Unlike DDR, purchasing RDRAM is a little more tedious. Users of RDRAM must buy them in matching pairs in order to use them properly, this because of their 16 bit serial nature. Rambus has introduced new 32-bit RDRAM which works in parallel and which will shorty free it from the old constraints. The new RDRAM RIMM 4200's cannot be used in single sets, but at the moment they are very not widely available. We are testing PC800 RDRAM manufactured by Samsung, and as it is the older 16 bit serial type, we need to install them in matching pairs. Here we have two 128 MB PC800 RIMMS . 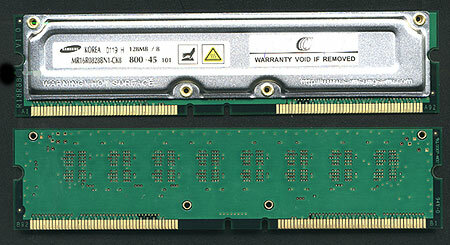 Because RDRAM runs at such a high frequency, Rambus requires all memory manufacturers to add ramsinks to their RIMMS. As you can see, the heat spreaders on the PC800 RDRAM are more robust then the ones found on DDR. During testing the RIMMS did get quite warm to the touch but not as hot as some DDR we've tested in the past. We haven't played with a lot of RDRAM in the past so we really weren't too sure what to expect. Our overclocking attempt were hampered by the fact we're using a Williamette Pentium 4 2.0 GHz processor. Still we were pleased to see that the RDRAM would run up to 112 MHz on our MSi 850Pro5 motherboard while keeping the 400 MHz setting in the BIOS.